Professor Shiller devotes the beginning of the lecture to exploring the theoretical determinants of the level of interest rates. Eugen von Boehm-Bawerk names technical progress, roundaboutness, and time preference as the crucial factors. Professor Shiller complements von Boehm-Bawerk’s analysis with two of Irving Fisher’s modeling approaches, the view of the interest rate as the equilibrium variable in the savings market and the perspective of simple Robinson Crusoe economies on the determination of interest rates. Subsequently, Professor Shiller focuses his attention on present discounted values and derives the price for discount bonds, consols, annuities, as well as corporate bonds. His treatment of the term structure of interest rates leads him to forward rates and the expectations theory of the term structure of interest rates. At the end of the lecture, he offers insights on usurious loan practices, from ancient times until today, and describes the improvements in consumer financial protection that have been made after the financial crisis of the 2000s. 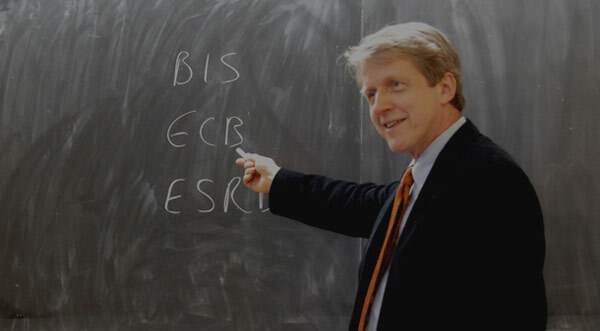 Professor Robert Shiller:. We’re talking about the theory of debt and interest rates. So, I want to talk about a number of technical topics first. We’re going to start with a model, an Irving Fisher model of interest. And then I’m going to talk about present values, and discount bonds, compound interest, conventional bonds, the term structure of interest rates, and forward rates. These are all technical things. And then, I want to get back and think about what really goes on in debt markets. There are two assignments for this lecture. One is several chapters out of the Fabozzi manuscript. And then, there’s a chapter from my forthcoming book that I’m currently writing, but that is the most meager chapter that I’ve given you yet. The book is not done, so I think the real reference for this is the Fabozzi et al. manuscript, at this point. And then, Oliver will give a TA section that will clarify, I think, some of the points. So anyway, what we’re talking about today is interest rates. The percent that you earn on a loan, or that you pay on a loan, depending on what side of it you are. And interest rates go back thousands of years. It’s an old idea. Typically, it’s a few percent a year, right? The first question we want to try to think about is what explains that. Why is it a few percent a year? And why not something completely different? And why is it even a positive number? Ever think of negative interest rates? Well, these are basic questions. So, I wanted to start with the history of thought and an economist from the 19th century, Eugen von Boehm-Bawerk, who wrote a book on the theory of interest in the late nineteen century. Actually it was 1884. And it’s a long, very verbose account of what causes interest rates. But basically, he came up with three explanations. Why is the interest rate something like 5%, or 3%, or 7%, or something in that range? And he said, there are really three causes. One of them is technical progress. That, as the economy gets more and more scientific information about how to do things, things get more productive. So, maybe the 3% percent, or the 5%, whatever it is, is the rate of technical progress. That’s how fast technology is improving. But that’s not the only cause that von Boehm-Bawerk talked about. Another one was advantages to roundaboutness. That must be some translation from his German. But the idea is that more roundabout production is more productive. This isn’t technical progress. If someone can ask you to make something directly right now, you’ve got to use the simplest and the most direct way to do it, if you’re going to do it right now. But if you have time, you can do it in a more roundabout way. You can make tools first and do something else that makes you a more efficient producer of this. And so, maybe the interest rate is a measure of the advantages to roundaboutness. And the third cause that von Boehm-Bawerk gave is time preference. That people just prefer the present over the future. They’re impatient. This is behavioral economics, I suppose. This is psychology. That, you know, you’ve got a box of candy sitting there. And you’re looking at it and you’re saying, well, I should really enjoy that next year. Well, maybe it would spoil by next year. Next month. But somehow you don’t. You have an impulse to consume now. So maybe the rate of interest is the rate of time preference. Why is the interest rate 5%? It’s because people are 5% happier to get something now than to get it in the future. So, he left that train of thought for us. This was not Mathematical Economics. It was Literary Economics. But the next person I want to mention in the history of thought is Irving Fisher, who was a professor at Yale University. But he wrote a book in 1930 called [The] Theory of Interest. And it is the all-time classic, I think, on this topic. So, Irving Fisher is talked about in your textbook by Fabozzi, and he’s talked about in many textbooks. He graduated from Yale. I mention this, since you’re Yale undergrads. He was a Yale undergrad. He graduated, maybe it was in 1885. And he got the first Economics Ph.D. at Yale University in the 1890’s. And he just stayed here in New Haven all his life. And if you were living in New Haven in the early twentieth century, you’d know him because he was a jogger. Nobody else jogged. He would exercise and run around campus, so everyone would see him. In the 1910’s or ‘20’s, nobody did that. But he did. He was a health nut, among other things. I could talk a lot about him; he’s a fascinating guy. I’ll tell you one more story about him. He would invite students to his house for dinner. And he would explain to them before dinner that he believed that proper eating required that you chew every bite 100 times before you swallow it. So, he would tell his students to do that. And it slowed down conversation at dinner a great deal. But that’s not what he’s known for. What he’s known for is, among other things, his theory of interest. So, this is what’s talked about in your textbook and I wanted to start out with Irving Fisher because–by the way, I don’t know when this room was built. Does anyone know? Because he died in ‘47. He probably lectured from this same blackboard, right? So, I don’t know, this same slate, it could be, right? It could go back to that time. So, I’m going to put back on the board what he had on this board, I’m assuming in some time in the 1930’s. What your author, your textbook author, Fabozzi, emphasizes for a theory of interest is something that came from Fisher that’s very simple. And he says, the interest rate–this is Fabozzi’s distillation of Irving Fisher–the interest rate is the intersection of a supply and demand curve for savings. So, I’m going to put saving, s, on this axis. And on this axis, I’m going to put the interest rate, call that r. I don’t know why we commonly use r for interest. It’s not the first letter; it’s in the middle of the word. And the idea is that there’s a supply of saving at any time. That people then wish to put in the bank or someplace else to earn interest. And the theory is that the higher the interest rate, the more people will save. So, we have an upward-sloping supply curve. Now this S means supply, whereas this S down here means saving, OK? And then there’s a demand for investment capital, right? The bank lends out your saving to businesses, and the businesses want to know what the interest rate is. The lower the interest rate, the more they’ll demand. So, we have a demand curve for saving. And then the intersection of the two is the interest rate. Well, it gives the interest rate on this axis and the amount of saving on the other axis. That’s a very simple story. And that’s what Fabozzi covers in your text. But I wanted to go back to another diagram that Fabozzi et al. did not include in your textbook, but it also comes from the 1930 book, [The] Theory of Interest. That is a diagram that shows a two-period story. And the thing I liked about this two-period diagram is that it brings out the von Boehm-Bawerk causes of interest rate in a very succinct way. So, this is the second Irving Fisher diagram. I’m going to do a little story telling about this. Remember the book, Robinson Crusoe. It was written by Jonathan Swift in the 1700’s. It was the story of a man named Robinson Crusoe, who was marooned on an island all by himself and had to live on his own with no help. This is a famous story; we call it a Robinson Cruise economy. There’s only one person in the economy, so, of course, there’s no trade. But we’ll move to a little bit of trade. I’m just telling you a story of the rate of–there’ll be a rate of interest on Robinson Crusoe’s island. I’m going to show here consumption today. And on this axis, consumption next year. All right. I don’t remember the novel. Did anyone here read it? Somebody must have read Robinson Crusoe. But I’m not going to be true to the story. The story I’m going to tell is that Robinson Crusoe has some food. That’s all that the whole economy just is, let’s say it’s grain. I don’t know how he got that on the island. But he’s got grain. And he’s deciding how much to eat this year, and how much to plant for next year. So, the total amount of grain he has is right here. So, that is his endowment of grain. That’s the maximum he could eat. But if he eats it all, there won’t be any grain to plant for next year, OK? So, he better not eat it all, OK? Or he’ll starve next year. Now, in a simple linear production–with technology that’s linear, he can choose to set aside a certain amount of grain, which is the difference between what he has and what he’s consuming. And then that will produce grain next period. So, I’m going to draw a straight line. That’s supposed to be a straight line. These are all supposed to be straight lines here. And that is his choice set under linear technology. I’m drawing it with no decreasing returns. The idea is that for every bushel of grain that he plants, he gets two bushels next year, or whatever it is, OK? And so, if he were to consume nothing this period, he would have–if I drew this thing with the right slope of -2–he would have twice as much. This is the maximum he could have next period, OK? And so, he could consume anywhere along this point, this line. And this would be the simplest Robinson Crusoe economy. So, what does he do? Remember from elementary micro theory, he has indifference curves between consumption today and consumption tomorrow. Remember these? These are like contours of his utility. And we typically draw them like this. So, what does he do? He maximizes his utility and chooses a point with the highest indifference curve touching the production possibility frontier. This is the PPF, the production possibility frontier. And that determines the amount that he consumes and the amount that he saves. And he consumes this amount here. And the difference between his endowment and his consumption is his saving. And then, next period, he consumes this amount. All right, that’s simple micro theory. That’s familiar to you? So in this case, the interest rate, the slope of this line–this slope is equal to –(1+r) where r is the interest rate. So in this case, I’ve told a very simple story. It has only one von Boehm-Bawerk cause, its roundaboutness. But maybe there’s technical progress, too, I don’t know. It has maybe a couple of his causes. If, as time goes by, Robinson Crusoe figures out better how to grow grain, there could be a technical progress component. But preferences don’t matter in this story, right? The preferences I represented by his indifference curves. And since I’ve got a linear production possibility frontier, impatience doesn’t matter. The interest rate in this case is decided by the technology, the slope of the curve. So, we don’t have all of von Boehm-Bawerk causes yet. OK. Next step. That was the simplest Irving Fisher story. The next step is, let’s suppose, however, that there are diminishing returns to investment in grain, all right? That means, for example, maybe when he grows a little bit of it he’s very good at it and he produces a big crop. But as he tries to grow more grain, he gets less productive. Maybe he has to do it on the worst land or he’s running out of water, or something is not going right. Then we would change the production possibility frontier, so that it concaves down. Something like that. Do you see what I’m saying? Diminishing returns to investment. As you keep trying to add more and more grain to your production, as you save more and more, you get less and less return. So now, we have a new production possibility frontier that is more complicated. So now, what happens? Forget this straight line, which I drew first, and now consider a new production possibility frontier that’s curved downward. Well, what does Robinson Crusoe do? Well, Robinson Crusoe picks the highest indifference curve, right, that touches this production possibility frontier. So, that means he finds an indifference curve that’s tangent to it. And he chooses that point. OK? So, this is what Robinson Crusoe would do. Now, the interest rate is the slope of the tangency between the indifference curve and the production possibility frontier. It’s the same for both. And this was the insight that von Boehm-Bawerk maybe had a little trouble getting. There’s two different things determining the interest rate. One of them is the production possibility frontier, and the other one is the indifference curves. Now, we have all of von Boehm-Bawerk causes. We’ve got roundaboutness, we have technical progress, and we have impatience. Well, the impatience would be reflected by the slope of the indifference curves. So, let me put it this way. Suppose Robinson Crusoe really wanted to consume a lot today. He was very impatient. That means that his indifference curves–did you give me colored chalk? Student: There’s a little bit of yellow. Professor Robert Shiller: Oh, we have a little yellow. All right. Suppose Robinson Crusoe is very impatient. He wants to consume. Now, he doesn’t care about the future. Then, his indifference curves might look–I’ll just draw a tangency–his indifference curve might look different. They might look like this. So, he would have a tangency further to the right, consuming more today and less in the future. Now, the slope here is different than the slope here, right? Because I haven’t changed the production possibility frontier but I’ve moved to a different point on the production possibility frontier. So, you can see that if Robinson Crusoe becomes more impatient, his interest rate goes up. Now you understand that the interest rate in the Robinson Crusoe economy is not just about Robinson Crusoe. Even though there’s only one person in this economy, it’s about all of Eugen von Boehm-Bawerk’s causes. The technology is represented by the technical progress and the roundaboutness, and the preferences are represented by the indifference curves. And you can see that the actual rate of interest in his economy is determined by the tangency. Now on the other hand, suppose Robinson Crusoe were very patient and really wants to live for the future. Then the highest indifference curve that touches the production possibility frontier might get up here, right? Now that’s another Robinson Crusoe with a different personality, who’s more patient. Then the tangency would be up here and the interest rate would be much lower, because the interest rate would be the slope of the line that goes through that tangency point, tangent to both the indifference curve and the production possibility frontier. So, this is just a one-person economy. Is this clear? So, I’ve drawn a lot of line, maybe I should start all over again. We’ve now gotten all of von Boehm-Bawerk’s causes of interest. And we’ve got an interest rate. We’ve tied it to production–technology, represented by the production possibility frontier, and taste, represented by the indifference curve. But now I want to add a person to the economy. So, let me start all over again. There’s two Robinson Crusoes in this island. And let’s start out with autonomy. They haven’t discovered each other yet. They’re on opposite sides of the island. They have the same technology. They have the same production possibility frontier, but they live on opposite sides of the island, and they don’t trade with each other. So, let me start out again. This is the same diagram. We have consumption today, and consumption next year, again. And we have a production possibility frontier. That’s the same curve that I drew before. And the technology is the same for both of them. And let’s suppose they have the same endowment. But let’s suppose that Crusoe A is very patient, and Crusoe B is very impatient. [Correction: Crusoe A is impatient, Crusoe B is patient, to be explained below.] So, Crusoe A, his indifference curves form a tangency down here. So, this is A. And Crusoe B’s indifference curves are up here. This is B. And so, they are planning to plant. That means that Crusoe A will be saving very little. I mean, will be consuming a lot. A is the impatient one, the way I’ve drawn it. Consuming a lot now and not saving much for the future, but is maximizing his utility. That’s why we have the highest indifference curve shown here with this tangent. And Crusoe B is the very patient one. And is consuming very little this year and plans to consume a lot next year. So, let’s say they’re about to plant, according to these tastes. And then they find each other. Now, they realize, there’s two of us on this island. Now, we’re getting a real economy with two people. So, what should they do? Well, the obvious thing is that there are gains to trade. And the kind of trade would be in the loan market. This Crusoe B is suffering a lot of diminishing returns to production. So, he really shouldn’t be planting so much grain, because he’s not getting much return for it. Whereas this other guy on the other side of the island has very high productivity. He can produce a lot for a little bit of grain. So, he should tell Crusoe A, you should plant some of this grain for me. You are more productive, because you’re not doing as much. Well, in short, what will happen is, they’ll do it through a loan. I will loan you so much grain. There’s no money. A wants to consume a lot. So, B will say, instead of planting so much, we’ll strike a loan to allow you to consume along your tastes. And what will happen in the economy is, we’ll find an interest rate for the economy that looks something–I’m going to draw a tangency. Like, that’s supposed to be a straight line. And on this tangent line, we have Crusoe B has maximized his utility subject to that tangent line constraint. And Crusoe A maximized his utility subject to the same constraint. And it has to be such a way that the borrowing market as shown over here clears. And, when we have that kind of equilibrium, you can see that both A and B have achieved higher utility than they did when they didn’t trade. So, this is the function of a lending market. So, A who wants to–did I say that right? A, who wants to consume a lot this period–the production point is here. And B lends this amount of consumption to A, so that A can consume a lot. He can consume this much. And B, since he’s lent it to A, consumes only this much this period. But you see they’re both better off. They’ve both achieved a higher utility. And what is the interest rate in the economy? The interest rate is the slope of this line. Well, the slope of this line is -(1+r). So, that is the Fisher theory of interest. And now, it’s much more complicated. You can see how all of Eugen von Boehm-Bawerk’s causes play a role. But the interest rate is not something you could have read off from any one person’s utility. It’s not just impatience. We’re both complicated people. We both have a whole set of indifference curves. And it’s not necessarily easy to define whether or how impatient am I. It interacts with the production possibility frontier in a complicated way to produce a market interest rate. So, this is the model for the interest of the economy that Irving Fisher developed. And so, I wanted to just take that as a given. Now, when you put it this way, it all looks indisputable that the loan market is a good thing, right? I can’t think of any criticism of the two Robinson Crusoes going together and making a loan. There’s nothing bad about this loan, right? They’re just both consuming more as a result. But I want to come back to criticisms of lending at the end of this lecture, because I want to try to make this course into something that talks about the purpose of finance and the real purpose of finance. And this story is not the whole story about real people and how they interact with the lending market. But before I do that, though, I want to do some arithmetic of finance. Let me move on to what I said I would talk about, mainly different kinds of bonds and present values. The Irving Fisher story was very simple, and it had only two periods. So, that’s too simple for our purposes. So, what I wanted to talk about now is different kinds of loan instruments. And the first and the simplest is the discount bond, OK? When you make a loan to someone, you could do it between a company or between a government and someone. A discount bond pays a fixed amount at a future date, and it sells at a discount today. It pays no interest. I mean it doesn’t have annual interest or anything like, it merely specifies this bond is worth so many dollars or euros as of a future date. So, $100/P is the ratio of my final value to my initial investment value if I invest in a discount bond. And I want to convert that to an annual interest rate. So, this is the formula that allows me to do that. So, r is also called yield to maturity. And the maturity is T, the time when the discount bond matures. So, it says if it’s paying an interest rate, r, once per year for T years–we can infer an interest rate on it even though the bond itself has a price, not an interest rate. I mean, we can calculate the interest rate by using this formula. Now, let me come back to compounding. This is elementary, but let me just talk about putting money in the bank here. So, compounding. If you have annual compounding, and you have an interest rate of r, and you put your money in the bank with annual compounding, and the interest rate is r, that means you don’t earn interest on interest until after a year. If you put in $1 today, 1/2 a year later you’ll have 1 + r/2 dollars, right? With an interest rate r. 3/4 of a year later, you’ll have 1 + 3/4r dollars. And then a full year later you’ll have 1 + r. But now, after one year, you start earning interest on the 1 + r. So, a 1/2 year after that, you would have (1 + r)(1 + r/2). And then two years later, you’d have (1 + r)2, and so on. That’s annual compounding. But the bank could offer you a different formula. They could offer you every-six-months compounding–twice-a-year compounding. Then, here’s the difference, after 1/2 a year, you’d have 1 + r/2, as before. But now, after 3/4 of a year, you would have, instead, (1 + r/2)(1 + r/4), and so on. Now, what Fabozzi likes to do is compounding every six months. This is what might make the textbook a little confusing. Because we naturally think of annual compounding. A year seems like a natural interval. But in finance, six months is more natural. Because, by convention, a lot of bonds pay coupons every six months. So, Fabozzi uses the letter z to mean r/2. And his time intervals are six months long. So, that means that the formula that Fabozzi gives for a discount bond assumes a different compounding interval. The Fabozzi assumption. He writes P=100/(1+z)t where the lower case t is 2T. And so, that’s the Fabozzi formula for the price of a discount bond. And, of course, it only applies at every six months interval. He’s not showing what it is at six and a half months, or something like that. So, is that clear about compounding and about discount bonds? Now, a fundamental concept in finance is present discounted value. If you have a payment coming in the future–So, I have a payment in T years or 2T six months, or we could say semesters. Then, the present value, depending on how I compound–well, let’s talk about annual compounding. The present discounted value of a payment in T years is just the amount, which is $x/(1+r)T. Or if you’re compounding every six months, it would be $x/(1+z)t.
Lower case t equals 2T. So, whenever we ask a question about present values we’ll have to make clear what compounding interval we’re talking about. By the way there’s also–I shouldn’t say by the way, it’s fundamental. There’s also continuous compounding. I talked about compounding annually, or twice a year. I can do it four times a year. If I do it four times a year, that means I pay 1/4 of the interest after three months, and then I start earning interest on interest after three months, and so on. What if you compound really often? You could do daily compounding. That would mean you would start earning interest on interest 365 times a year. The limit is continuous compounding. And the formula for continuous compounding is erT, where e is the natural number 2.718, r is the continuously compounded interest rate. So, your balance equals the initial amount–what did I say? $1 × erT. That’s continuous compounding. The unfortunate thing is that present values allow us to compute present values in different ways, depending on what kind of compounding I’m assuming. But if I have a sequence of payments coming in, the present discounted value of the sequence–and suppose they come in once a year–then it’d be natural to use annual compounding. And then the present discounted value, PDV, is the summation of the payments. And what am I calling them here? xi/1+r. And that would be a continuously compounded present value for a continuous stream of payments. So, if someone is offering me payments over time, then the payments have to be summed, somehow, into a present value. In finance, it often happens that people are promising to pay you something at various future intervals over time, and you have to recognize that payments in the future are worth less than payments today. Just as a discount bond is worth $100 in five years, but it’s not worth $100 today, it’s worth $100/(1+r)T.
appropriately compounded. And that’s true generally. Anything in the future is worth less. So, present discounted value is one of the most fundamental concepts in finance. That whenever someone is offering me a payment stream in the future, you discount it to the present using these formulas. So, for example, if you are lending to your friend to buy a house, and the person is promising to pay you over the years, then you’ve got to figure out, well, what is that payment worth right now? And you would take the present value of it. There are a few present value formulas that are essential. And I’m going to just briefly mention them. The present value of a consol, or perpetuity. A perpetuity or a consol is an instrument that pays the same payment every period forever. It was named after the British consols that were issued in the 18th century. They were British government debt that had no expiration date. And the British government promised to pay you forever an amount. OK, what is the present value? Now, we’ll call the amount that the consol pays its coupon. And let’s say the coupon were GBP 1 per year. If it was paying GBP 1 per year, and we’re using annual compounding, then the present discounted value is equal to GBP1/r. GBP 1 over the interest rate. That’s very simple, because this bond will always pay you GBP 1. And so, what is the interest rate on it? Your GBP 1 is equal r/PDV. So, the prices of the bond of the consol should be the payment divided by the interest rate. Another formula is the formula for an annuity. An annuity is a different kind of payment stream. It’s a consol for a while and then it stops. An annuity pays a fixed payment each period until the expiration of the—the maturity. So, it pays, let’s say, GBP x. Let’s not say GBP 1. If it pays GBP x every year, then the present discounted value–it pays GBP x from t equals 1 to T. And then it stops. T is the last payment. Then the formula is x/r[1-1/(1+r)T]. So, that’s the annuity formula. And that’s very important, because a lot of financial instruments are annuities. The most important example being a home mortgage, a traditional home mortgage. You might take out a 30-year mortgage when you buy a house. And the mortgage will generally say in the United States–it’s not so common in other countries–but in the United States it will say you pay a fixed amount–well, usually it’s monthly, but let’s say annually for now–a fixed amount every year as your mortgage payment. And then you pay that continually until 30 years has elapsed, and then you’re done. No more payments. OK. The final thing I want to talk about is a corporate bond, or a conventional bond, which is a combination of an annuity and a discount bond. And so, a conventional corporate bond, or a government bond, pays a coupon every six months. So, a conventional bond pays coupon c, an amount c, in dollars, pounds, or whatever currency, every six months. And principal plus c at the end. So, that means that it’s really an annuity and a discount bond together, right? And so, the present discounted value for the conventional bond would be the sum of the present discounted value using the annuity formula for x=c plus the present discounted value of the principal, which is given by the–well, it would be this one, where you have r/2, because it’s every six months. And then the final–I think it’s the final concept I want to get at before talking a little bit about other matters. I want to talk about forward rates, and the term structure of interest rates. Now, at every point in time there are interest rates of various maturities quoted. And we want to define the forward rates implicit in those maturity formulas. And this is covered carefully in your textbook of Fabozzi. I’m just going to do a very simple exposition of it. The concept of a forward rate, forward interest rate, is due to Sir John Hicks, in his 1939 book, Value and Capital. About 20 years ago, I was writing a chapter for the Handbook of Monetary Economics about interest rates. And I was trying to confirm who invented the concept of forward interest rates. So, I’ll build a little story around this. I thought it was Sir John Hicks, reading his 1939 book, and I couldn’t find any earlier reference. So, I asked my research assistant, can you confirm for me that the concept of a forward interest rate is due to Hicks. And my graduate student looked around and tried to find earlier references to it and he could not. Then, one day the graduate came to me and said–this is like 20 years ago. The graduate said, why don’t you ask Hicks? And I said, wait a minute. This book was written in 1939. Is that man still alive? And he said, I think he is. So, I wrote to the United Kingdom. I found his address. I forget, Cambridge or Oxford. I forget. And I said, did you invent the concept of forward interest rates? And then six months went by and I got no answer. Then I got a paper letter–they didn’t have email in those days–from Sir John Hicks. And it was written with trembling handwriting. And he said, my apologies for taking so long to answer. My health isn’t good. But he said, to answer your question, he said, maybe I did invent the concept of forward interest rates. But he said, well maybe it wasn’t. Maybe it was from coffee hour at the London School of Economics, where he was visiting in the 1920’s. So, here we go, OK? Sir John Hicks is reminiscing to me about what happened in coffee time in the 1920’s. So, I’m just trying to convey what he told me they were thinking. At any point of time, you open the newspaper and you see interest rates quoted for various maturities. That’s called the term structure of interest rates. For example, you will find Treasury–well, you’ll find one-year rates quote, there’ll be a yield on one-year bonds. There’ll be a yield on two years. There’ll be a yield quoted on three-year bonds. Right? Let me tell you right now, for most of the world today, if you want to borrow money for one year, it’s really cheap. In Europe, or U.K., U.S., over much of the world it’s like 1%. U.S., it’s less than 1%. It depends on who you are, what your borrowing rate will be, depending on your credit history. But if you have excellent credit, one-year interest rates are really low. But if you want to borrow for 10 years, it’s more like 3.5%. It’s higher, right? And if you want to borrow for 30 years, they might charge you 4% or 5%, OK? This is the term structure of interest rates, and it’s quoted every day in the newspaper. Well, I should say, I’m thinking 1925. In 1925, you’d go to the newspaper to see it. Now you go to the Internet to see it. So, newspapers don’t carry this anymore. But I’m still in the mode of thinking of Sir John Hicks. We’re in 1925. So, you open up the newspaper in 1925 and you get the yield to maturity, or the interest rate on various maturities. All for today. Everything that’s quoted in today’s paper is an interest rate between now, today, and so many years in the future. The one-year interest rate quoted is the rate between now and one year from now, right? And the two-year interest rate quoted is the rate from now to two years from now, and so on. So, Hicks and his coffee hour people were saying, well, it seems kind of one-dimensional, because all the rates that are quoted are rates between now and some future date. But what about between two future dates? And then they thought about this at coffee hour, and someone said, well, it’s kind of unnecessary to quote them, because they’re all implicit in the term structure today. And this is where the concept of forward interest rate comes. And it’s explained in Fabozzi. But I thought, I’m going to just try to explain it in the simplest term. Once we get the concept, it’s easy. And I’m going to assume annual compounding to simplify things. But in Fabozzi, he being a good financier, does it in six-month compounding. So, now the year is 1925, OK, and we’re in coffee hour. Suppose I expect to have GBP 100 to invest in ‘26, OK? It’s ‘25 now, this is a whole year from 1926, OK? And I want to lock in the interest rate now, OK? Is there any way to do that? I mean, I could try to go to some banker and say, can you promise me that you’ll give me an interest rate in 1926 for one year. The banker might do it, you know, but I don’t need to go to a banker to do that. Once I have all of these bonds available, and if I can both go long and short them, then I can lock it in. bonds, where r2 is the two-year yield. [addition: r1 denotes the one-year yield.] Discount bonds. They’ll mature in two years [addition: at GBP 100]. And then I have to short, in 1925, one-period bond that matures at GBP 100 [addition: in order to finance the first purchase]. So, suppose I do that, what happens after one period? Well, after one period, I owe GBP 100, right? Because I just shorted a one-period bond. So, I pay GBP 100, that’s like investing GBP 100. At the end, I get this amount times GBP 100, right? Because this is the number of bonds that I bought. It’s just the amount that I get. What I’ll get if I bought this number of bonds, I get GBP 100 times this number in two periods in 1927, but I put out GBP 100 in 1926. So, the ratio of the amount that I got at the end, to the amount that I, in ‘27, that I put in in ‘26 is given by this. So, that’s 1 plus the interest rate I got on the bond. So, you can compute forward rates. I’m just showing it for a one-year ahead forward rate for a one-year loan. But you can compute it for any periods further in the future over any maturity. And this is the formula given, it’s on page 227 of Fabozzi. I’m not going to show you the general formula. The expectations theory of the term structure is a theory that–I’ll write it down. Expectations theory says that the forward rate equals the expected spot rate. So, do you see what I’m saying? Here in 1925, I open The London Times, and right there I have printed the whole term structure today. And I can then compute, using forward rate formulas, the implied interest rates for every year in the future. Even out to 2010, they could have computed–if they had bonds that were that long–I think they had a few. See, 1925. Some bonds go out 100 years. If you wanted to do the one-year rate in 1925, for the year 2011, you’d have to find a pair of bonds. One of them maturing in 2011, and another one maturing in 2012. And if you did that, you could get an interest rate for this year. So, that was kind of the realization that Hicks got, that the whole future is laid out here in this morning’s paper. All the interest rates for–maybe not out to 2011–but out to a long time in the future. And so, what determines those interest rates? So, Hicks, in his book, wrote, the simplest theory is the theory that these forward rates are just predictions of interest rates on those future dates. So, we could go back and see, what were they predicting? They weren’t thinking so clearly, definitively, about 2011, but they must’ve been, because they were trading these bonds. And so, you could test whether the expectations theory, whether people are forming rational expectations by looking at those forecasts and seeing, were they right? Now there’s a huge literature on this, but Hicks said that–just stop with this–Hicks said that the expectations theory doesn’t quite work, because there’s a risk premium. That the forward rates tend to be above the optimally forecasted future spot rates–spot meaning, as quoted on that date–because of risk. And people are uncertain about the future, so they demand a higher forward rate then they expect to see happening in the spot rate. So, I will stop talking technical things. I wanted to say something. I have so much more to say, but I’ll have to limit due to time. What I’ve laid out here is a theory of interest rates. And I’ve done some interest rate calculations. And I’ve pointed out the remarkable institutions we have that have interest rates for all intervals, out maybe 100 years. And so, it’s all kind of like the whole future is planned in these markets. It seems impressive, doesn’t it? And when I told you the Robinson Crusoe story, didn’t that sound good? Like when the two Robinson Crusoes discover each other, aren’t they obviously doing the right thing to make a loan from one to the other? And I like that. I think basically everything I’ve said here is basically right. But I wanted to say that one of the themes of this course is about human behavior and behavioral economics. And I wanted to talk a little bit about borrowing and lending, and how it actually plays out in the real world. And how our attitudes are changing, our regulatory attitudes are changing. So, let me just step back. You know, I think this literature, Irving Fisher and von Boehm-Bawerk, and many others who’ve contributed to the understanding of interest rates, is very powerful and important. And it supersedes anything that had been written in the last thousands of years. They had interest rates for thousands of years, but that simple diagram, that Fisher-diagram, came just a short time ago. It’s hardly long ago at all. But I wanted to step back and think about what people said about interest rates going way back in time. And so, I was going to quote the Bible. There’s a Latin word. Do you know this word? Do you know what that means in Latin? Well actually our English word “use” comes from it. I don’t know how to pronounce it. ”Usura” in Latin means use. And it means, also, interest. Because, what is interest? You’re giving someone the use of the money. You’re not giving them the money. They’re getting the use of the money. And they had other words for interest. But this ancient word had a negative connotation. It sounded bad. It kind of meant something immoral, OK? And so, we have a word called usury. You know this word. This is English now. It goes back more than 2000 years. I actually have it here in Latin. I’m just curious about these things, but I can’t pronounce it right. It must have been written in Greek, or Aramaic, or something originally, but it uses the word, “usury,” usura. But the quotation, it says in Exodus, “If thou lend money to any of my people that is poor by thee, thou shalt not be to him as an usurer. Neither shalt thou lay upon him usury.” Now what does that mean? Because usura could mean both interest and excessive interest. So, it’s not clear what the Bible is saying about lending. It sounds like it’s telling you, you can’t lend–you can lend someone money, but don’t take any interest. That’s what it seems to be saying but it’s ambiguous. I was going to quote the Koran. I don’t speak Arabic. I think there’s a similar ambiguity in Arabic. And I’m quoting an English translation of the Koran: “Oh you who believe. Be careful of Allah, and give up the interest that is outstanding.” Or usura. That has been interpreted by modern Islamic scholars as that charging interest is ungodly. And it was interpreted by Christian scholars. They go back and they try to figure out what was meant, and they couldn’t figure it out, either. Times change over the centuries. But for thousands of years the Catholic Church–or maybe not thousands, I don’t know the whole history of this. It depends on which century you’re talking about. But for many centuries, the Catholic Church interpreted this, as do many Muslims today, that interest is immoral. And therefore, the only people who were allowed to loan were Jews, because they weren’t subject to the–even though it’s actually the Book of Exodus–but they weren’t subject to the same interpretation. So, it was considered immoral. I wonder, why is that? Why is it immoral? Because we just saw the logic of it. Now, the Robinson Crusoe story. I had two different men on the other side of the island. And I had one of them wanting consumption today and of one of them wanting consumption later. Your first question is, maybe they were wrong to be different. Maybe they should both be doing the same thing. Why is one of them different than the other? The guy who’s going to consume a lot today, maybe I should have a word with this guy. You know, don’t do it, you’re going to be really hungry next year. Why you doing this? So, instead of forming a loan between the two, we should advise them. And maybe they don’t need a loan. So, this comes back to, what are we doing with our loans? And, are we giving people good advice? Or do we have a tendency in the financial world to be usurious? Are we going after and victimizing people by lending them money? I think that there is a problem. And this thousands of years of history of concern about usury has to do with real problems that develop. So, just in preparing for this lecture, on an impulse, I got on to Google, and I searched on vacation loans. I found 1.6 million websites that were encouraging you to take out a loan to go on a vacation, OK? Now, is that socially conscious? I was wondering about that. Is it ever right to borrow money to go on a vacation? I mean, I’ve thought about it. And then I remembered, Franco Modigliani, who was one of the authors of your textbook, and he was my teacher. I still remember these moments from classroom. And he was teaching us about these subjects. He was thinking about examples of investments–and he said, you know? One of the best investments I can think of is a honeymoon. When you get married, you go on a vacation. Now, why are you doing that? Is it for fun? Probably not. In fact, I have a suspicion that most honeymoons are not fun. I think it’s just people are too uptight and tense. What have we just done? And I bet that’s right. So, why do you do it? Well, you do it as an investment, right? You want this photograph album. You want the memories. You’re kind of bonding. I think he’s absolutely right. You should go on a honeymoon. So, I did another search. I searched on honeymoon loans, OK? And I got 1.7 million hits. It beat vacation loans. So, there are many lenders ready to lend. And you should do it. If you’re just getting married and you don’t have any money, go to the usurious guy and ask for the honeymoon loan. So, I’m not sure whether it’s bad. This is a question. I think that there are abusers. And I wanted to just close with Elizabeth Warren. I first met her just a few years ago. Well, actually, I remember her book. She wrote some important books. She’s a Harvard law professor who wrote books. One of her books was published by Yale, called The Fragile Middle Class. And it’s about people who go into bankruptcy. And she points out that in the U.S., even back in the old days when the economy was good, we had a million personal bankruptcies a year. This is because of borrowing. You don’t know how many bankruptcies there are, because people are ashamed when they declare bankruptcy. And they try to cover it up from as many people as possible. There are as many personal bankruptcies in a normal year as there are divorces. But you don’t hear about them, right? You hear about all kinds of divorces. People are ashamed of divorces, too. But they can’t cover them up because everybody knows. But they can pretty well cover up a bankruptcy, and so they don’t talk about it. So, what Elizabeth Warren is saying, she thinks that the lending industry is victimizing people. It’s advertising for vacation loans and the like, and then they don’t tell people about the bad things that will come. So, she wrote an article, and this is interesting, it was in Harvard Magazine. And that’s a magazine that I suspect none of you read. Anyone read Harvard Magazine? OK. It’s the Harvard alumni magazine. It goes out to all graduates of Harvard. So, you don’t read it, and you probably will never read it. You will be a reader of the Yale Alumni Magazine, which will start arriving in your doorstep after you graduate. And it will also include your obituary in the next century when that comes. But the Harvard alumni magazine published this wonderful article about Elizabeth, describing all of the abuses that happen in lending in the United States. I don’t know how I ended up reading it. I think it was just such a nicely written piece that it just became one of their success stories. Most people don’t read that magazine, but I read it, and a lot of people read it. And she was so successful in convincing the public–this is just two years–or 2008, three years ago–she was so successful that she got a Consumer Financial Protection Bureau inserted into the Dodd-Frank bill. And we now have a regulator, a new regulator, that’s supposed to stomp on these usurious practices. It’s kind of an inspirational story, but the downside of it is, she got too carried away criticizing the lending industry in that nice article. And it makes them sound worse than they really are, and so Obama could not appoint her to head the Consumer Financial Protection Bureau, because it would be too politically controversial. So, she is now the person trying to find someone to head her bureau. But I think that this is just another step, and it’s happening in Europe and other places. The financial crisis has made us more aware of bad financial practices. And so, usury is again on our mind. Usury is abusive lending that’s taken without concern for the person who’s borrowing. And I think what it means to me is that–we’ll come back to talk about regulation in another lecture–but that the original Irving Fisher story and von Boehm-Bawerk story about interest was right. And even vacation loans, especially honeymoon loans, are right. But we need government regulation to prevent abuses. And we do still have abuses in the lending process. So, I’ll stop with that and I’ll see you on Monday.